"For a long time he was, pound for pound, the best swimmer," said Australian Olympian James Magnussen. "He will remain one of the fiercest competitors I've ever stood on the blocks next to. RIP little guy, you won't be forgotten." South Africa's Olympic gold medallist Chad Le Clos tweeted: "RIP brother, so sad to hear the tragic news you were a great example to everyone and will never be forgotten." 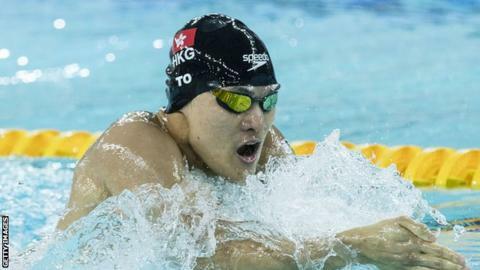 The Hong Kong Sports Institute said in a statement that To "felt unwell at a training session and was taken to hospital where sadly he passed away". It added: "He was extremely popular and loved by his team-mates and competitors. Kenneth was known as a truly exceptional person, warm, funny and kind. His sudden passing is a huge loss to local sports." To also won the men's overall title in the Fina Swimming World Cup in 2012 and claimed three medals in the World Swimming Championships later that year.